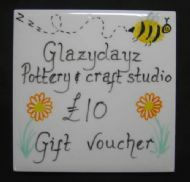 Our funky gift vouchers take the form of individually painted, glazed, & fired tiles - and they wrap beautifully into little gifts to hand over to loved ones! They never expire, & they're available in various denominations. You can buy them in person at our studio, or by credit card over the phone on 01531 636019 - (in which case we can post them out to you for a small additional P&P charge).